Final results with races 7, 8 and 9 unable to be sailed. Heat 7 was done and dusted on Saturday, with the conditions reaching 18 knots as forecast from the West South West. Roger and Gilligan were running second for the last half of the race with Brad Devine and Ian Furlong on Del Boca Vista managing to fight their way past Lindsay Irwin and Cam McDonald on Ronstan-Irwin Sails to be hot on their heels to the finish line. After reviewing the photos, it was a very close call but the Del Boca Vista boys managed to poke their nose just out in front to finish off second. Roger and Gilligan were third. The overall consistency trophy went to Zero (11th overall), which was skippered by Sean Carr and crewed by Scott Cole (yours truly!). Proving that “14s are forever” and constantly attracting new talent of all ages - Sean was the youngest sailor of the series at 23 yrs of age, had only sailed an i14 less than a handful of times prior to the Championship and weighs less than 60kgs (130 pounds)… Anyone considering coming to Perth for the 2020 worlds, this place is about speed in manageable conditions for skippers and crews of all ages, size and experience. A special mention must be made for the outstanding work performed by Kevin Wilson (RO), the race committee and volunteers at the Perth Dinghy Sailing Club. This was an extremely well run event, with the experience and commitment by all involved being evident through the great racing we had. The decision to bring racing forward following the unprecedented and unexpected first day blow-out, allowed the RO to control when the race would start so that optimal conditions could be experienced by the sailors. Wishing all competitors and spectators safe travels home and a big thank you for attending the City of Perth 101st i14 Australian Championships. I'm having issues accessing the results at this time. Please refer to the results in the above "Progressive Results" table. Meanwhile, please enjoy the race report. The boys have won the title back! With one more race still remaining, Brad Devine and Ian Furlong on Del Boca Vista sealed the deal today… Congratulations to BD and Footy for winning the 2016 Australian Championships. Nonetheless, it’s going to be a big one tomorrow – There are still several boats contending for a place on the podium, so I’m sure there will be lots of people resting up tonight. As with Heat 5, today was once again sailed in a Westerly breeze. It didn’t blow its guts out, but there was certainly more than a mere zephyr at times… I believe the reading tipped at 17 knots but was more relaxed for the majority of the race. The start gun went off on time today, with yet again another fantastic course and start line. Hats off to the RO and team, they have put on a stellar show for us, first class professionalism all around. Mark Kristic and James Lanati on Too Late to Stop Now just beat BD and Footy to the first rounding; however, the Del Boca Vista boys put the gybe-set in first and got the lead almost straight away. Once they had a sniff, they jumped on it like a fatty on a cake and took it all the way to the line!!! Yet again the rest of us were left to fight it out, with positions from second all the way back constantly changing. Lindsay Irwin and Cam McDonald on Ronstan/Irwin Sails left their run relatively late but managed to find their groove and work their way through the pack to secure second. Roger Blasse and Andrew Gilligan on Do You Get it Yet worked like Trojans today and certainly deserved their third place. Tomorrow’s forecast is for 16 knots from the South West… Lovely! It’s going to be a nail-biter. Every regatta has to have its light wind day, today was it! We were hoping for 15 knots, but we had to settle for about 10 and swinging heavily from the West. The RO once again held up the start under the AP and we were off 20 minutes behind schedule. The team did a fantastic job to set a fair course and a relatively neutral start line considering how difficult this would have been with the fluctuating conditions. To do well today you either had to have a crystal ball, or a lucky horseshoe shoved deep up your wetsuit… Does anyone else find it suspicious how the guys at the very front of the fleet seem to constantly have both!? Mark Kristic and James Lanati on Too Late to Stop Now took command of the race at the first mark, with Dave Hayter and Tom de la Perrelle (best surname ever!) on El Diablo not far behind. The several boats behind these guys made it impossible to cover off in this write-up, as they swapped positions at EVERY opportunity. If we fast forward to the last work to the finish, there were four boats that could have taken the bullet. Mark and James were first around the bottom, with Dave and Tom hot on their heels and then Roger Blasse and Andrew Gilligan (second best surname – for a sailor!) on Do You Get it Yet and BD and Footy on Del Boca Vista just after them. This would have been a fantastic “balls hanging out” dual to the finish between this bunch had the breeze kicked in, but the wind was lightening off and shifting severely. As the group crept closer to the line, it was Dave and Tom on El Diablo that snuck it past within sneezing distance to secure the win from Mark and James on Too Late to Stop Now. Then BD and Footy decided it was their turn on Del Boca Vista to pull a rabbit out of their hat and edge just ahead for third from Roger and Gilligan. With the forecast showing the breeze is going to consistently build late tomorrow afternoon, the RO has decided to bring the start forward to 12:00 pm to aim to get the race in the perfect 15-18 knot window. Stay tuned, the pics tomorrow are likely to be awesome, unlike the boring “one-wire” crap that would have been captured today!!! What a day! To be honest, this one was a bit of a surprise to some of us... The forecast was always showing a sea breeze, however with the mercury in the high 30s (Celsius) and the late expected onshore shift, it was looking ominous. Alas, the “Freo-doctor” didn’t let us down and after a short while under the AP flag, the race was started in a consistent 13+ knot sea breeze, with uninterrupted flat water. If we thought Heat 3 was tactical, today’s racing was a spectacle! Several boats decided to peel off early at the start and divided the fleet. Those that banged the left-side, won the first leg! From memory, it was a coin toss between Chris Vaughan and Matt Balmer on Ron Jeremy and Lindsay Irwin and Cam McDonald on Ronstan-Irwin Sails that were the first to round and set the kite. Second work up decided to show the right-side some love… This mixed things up a bit as the fleet was well and truly split over both sides. Stu Sloss and Eike Ehrig on Wembley Plumbing picked it like a dirty nose and came through the fleet with a comfortable lead at the top. Once they got there, they put the foot down and won convincingly. The rest of the fleet continued to battle it out, with both sides of the course showing promise at times. Brad Devine and Ian “Footy” Furlong were in the home stretch to the finish in second; however, Greg and Brodie Coutts on Giving It Some Grunt were clearly inspired by David Warner’s history making first-session ton this morning, that they dug deep and managed to pip the local legends on the line. BD and Footy did secure third and are currently leading the championship after 4 heats. Today was a special one. You could have thrown a blanket over the front 15 or so boats at the finish line, which demonstrates how close the racing is shaping up. Another 12-15 knot sea breeze forecast for tomorrow, just beautiful! Photos with thanks to Haydn Mahar Photography and Design. 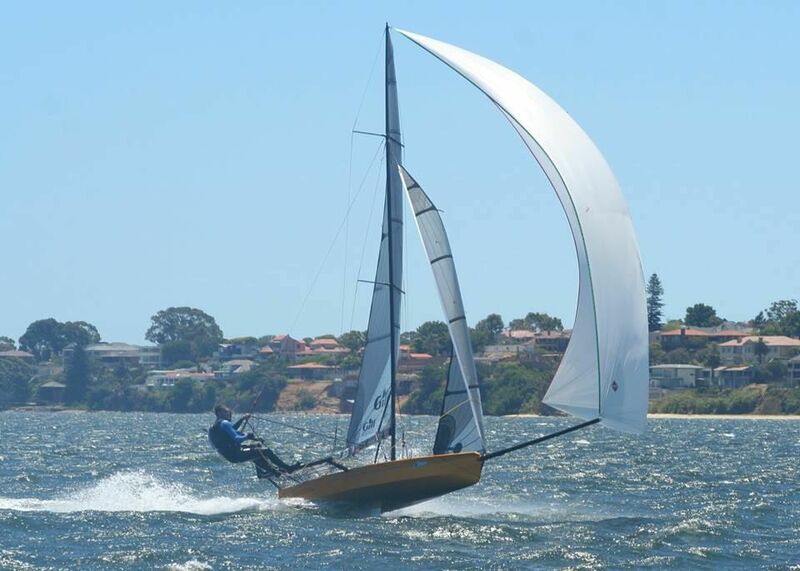 Perth rolled out perfect sailing conditions for Heat 3, which was sailed in 12 to 16 knots and a balmy 34 degrees. A clear start once again with the fleet splitting very early. Those that went to the right got an early advantage with Brad Devine and Ian 'Footy' Furlong and Roger Blasse and Andrew Gilligan getting the best of it. The shifts were big enough to make good gains and bad losses. Brad Devine and Ian 'Footy' Furlong lead around the top mark and were never headed. The next 6-7 boats were having an intense battle for the whole day with positions changing with each tack and gybe. The racing was close and intense. Mark 'Meaty' Krystic had gear failure and had to retire. At the finish, it was Brad Devine and Ian 'Footy' Furlong taking out their second win of the series with Roger Blasse and Andrew Gilligan in 2nd and Stuey Sloss and Eike Ehrig crawling into 3rd. Tomorrow looks lighter with another hot day with blue skies and flat water. What more could you ask for? With strong winds still lurking following the previous day, it was decided to bring racing forward to 12:00 pm. All boats were back on the water, but this time it was a very slow drift out to the race area. Following postponement for an hour, the race was started when the sea-breeze came in at a consistent 15 knots. Mark Kristic and James Lenati led around the first mark and that was the last anyone saw of them... They were lightning fast and secured their second win for the series (invitation race included). The rest of us managed to stay close together, which made for some great tactical racing. There were some fantastic rides experienced by all as the wind increased; however, the outgoing tide caused the usually flat water to throw up a few speed bumps on the last downwind which was fun! Brad Devine and Ian "Footy" Furlong secured second position, with Stuart Sloss and Eike Ehrig on Wembley Plumbing getting third. Lay-day today with everyone resting up and basking in the sensational 30 degree heat... Beautiful conditions forecast for the next 3 days of sailing. Stay tuned for what is shaping up to be an exciting series! What a start to the National Championships! 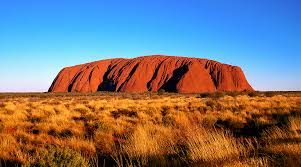 The below pic sums up the current extreme weather conditions across Australia following a once-in-50-year storm that blew through the normally barren Western Desert at Uluru (formerly Ayers Rock). The i14 contingent certainly experienced this on the water for our first race of the series last Friday. Of the 26 boats that started, only 8 finished. After hitting the water in near perfect sunny, sea-breeze conditions of 15-18 knots, the race committee got us off the start bang on 2pm. After completing the first windward/return, HUEY decided to make things interesting... Fair to say, none of us has experienced conditions like that on the Swan River before. An unprecedented strong front came through out of nowhere and saw winds gusting over 30 knots - the photographer from the day is currently being tracked down and will post pics of some of the wild rides in due course. Mark Kristic and James Lanati on Too Late to Stop Now controlled the race until the very last downwind, where they proved they are also mortal and put the boat in the drink... Brad Devine and Ian Footy Furlong on Del Boca Vista snuck through to take the win, with Lindsay Irwin and Cam McDonald on Ronstan-Irwin Sails taking second place. 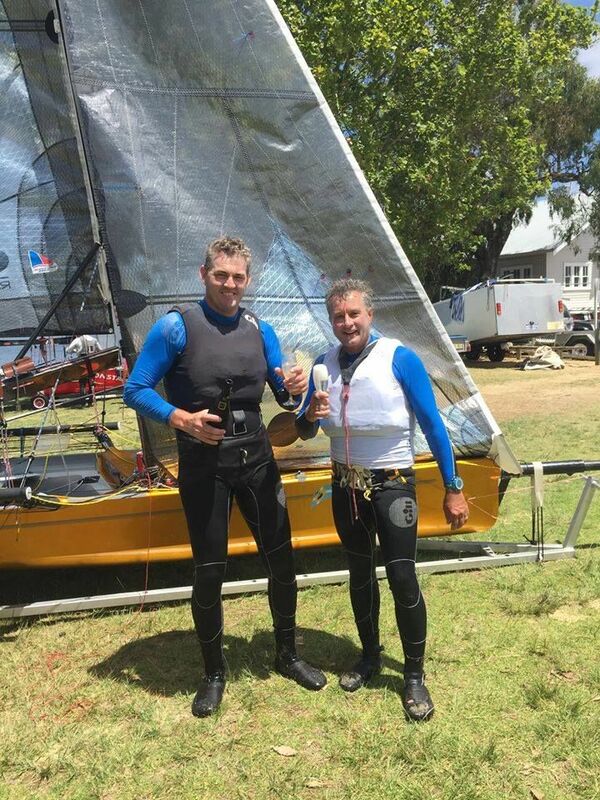 Mark Kristic and James Lanati got the boat up in time to seal the final podium spot. A special meeting was held the next day to discuss reviewing the protocols to assist the race committee in the future when extreme weather conditions are experienced. It was agreed a steering committee will be implemented to review the potentially antiquated guidelines surrounding the appropriate wind ranges and course lengths. These discussions will be shared with all sailors in due course. The first pic. 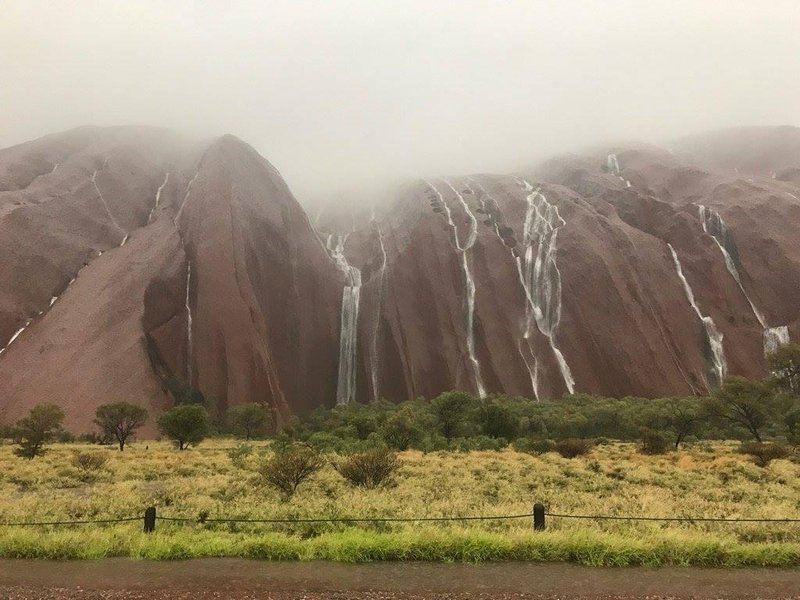 is normal Uluru and the second shows waterfalls following the recent freaky storm! 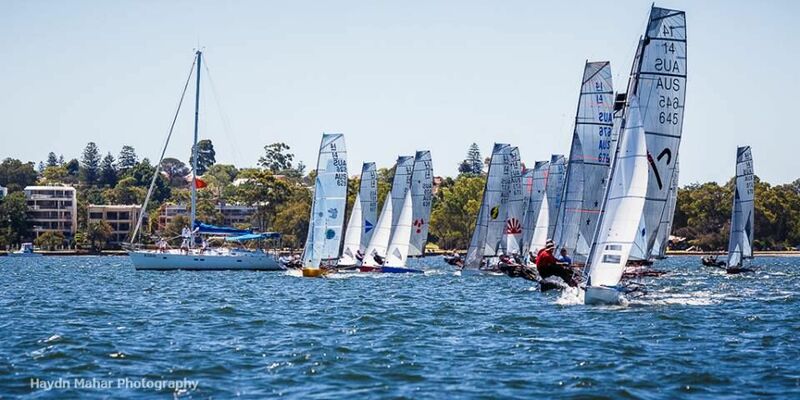 It has been voted that the Perth Dinghy Sailing Club will host the 2020 i14 World Championships on the Swan River, Perth!!! We look forward to putting on an excellent show for competitors and spectators alike! The i14 World Championships, sailed at Yacht Club de Carnac in France, are now all wrapped up! It was a fun filled regatta and the competition was of the highest level. The Brits are still unbeatable! Results below. The best spot to find photos is on the Yacht Club de Carnac Facebook page under the photos link. VR Sport TV are covering the event from a video perspective, so their website is best for viewing the most up to date videos. Well done to Brad Devine and Ian (Footy) Furlong on Del Boca Vista for taking out a perfect streak of race wins to take home the trophy. Congratulations to all who raced and in particular our podium finisehers El Diablo, Del Boco Vista and Ron Jeremy.